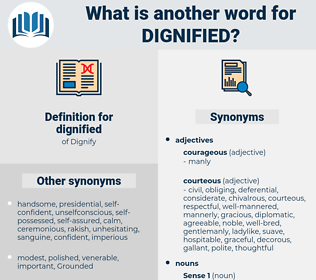 What is another word for dignified? deserving, respectful, fitting, honorable, noble, honourable, generous, credible, commendable, worthwhile, proper, reliable, trustworthy, honest, meaningful, praiseworthy, respected, unworthy, precious. respectable, humane, distinguished, solemn, noteworthy, valuable, fair. ignoble, dishonorable, unrefined, informal, insignificant, poor, ordinary, bad, indecorous, unimpressive, common. crude, unseemly, humble, crass, ridiculous, mortifying, coarse, vulgar, uncouth, improper, indecent, silly.
" A good time" is very like " a good dinner," in that one's appreciation of it depends largely upon personal taste; " what is one man's meat may be another's poison," and what to some is " a good time," to others would hardly be dignified by that title. She drew her hand away and stood erect, dignified now and calm.